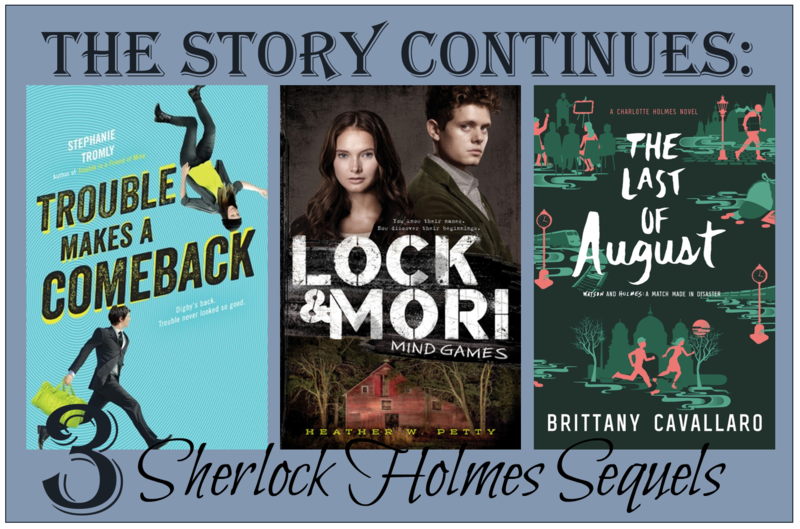 Last year one of my very favorite Reading on a Themes, was the one that I put together with a bunch of YA Sherlock Holmes retellings. I loved reading all of those books. We had Sherlock Holmes as girl. Watson as a girl. Sherlock Holmes in Australia. Sherlock Holmes at board school. Sherlock Holmes teaming up with Moriarty. That was a seriously fun post. Sequels for three of the five books in the original post were published in the last few months, and I couldn't resist bringing them together for an encore. I absolutely loved Stephanie Tromly's debut novel, Trouble is a Friend of Mine. When I heard it was getting a sequel that was basically my dream come true. 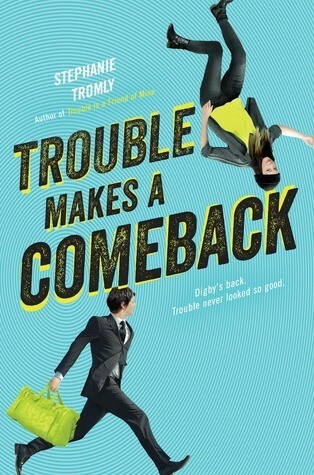 Trouble Makes a Comeback begins four months after the conclusion of the first book in the series. Zoe has settled into a semblance of a normal high school life. She has new friends, an after-school job, and a boyfriend. She's convinced herself that she is content with this less-zany, Digby-less existence. And then Digby returns. Digby's reappearance throws a wrench in Zoe's "I'm totally normal" plan. Where Digby is concerned, Zoe has very little self-control. 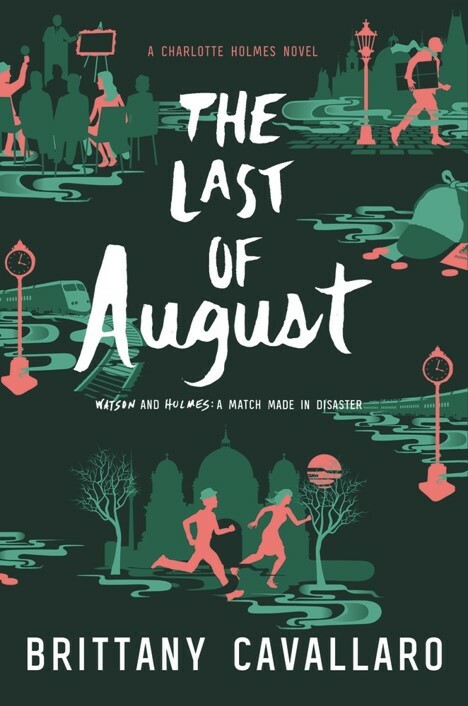 Digby has new information on the case of his missing sister, and the usually shenanigans ensure--Digby shows up, convinces Zoe to go sleuthing with him, they get in some scrape, narrowly escape, and then repeat the process all over again. There's also the unresolved issue of book one's kiss. Talk about tension. 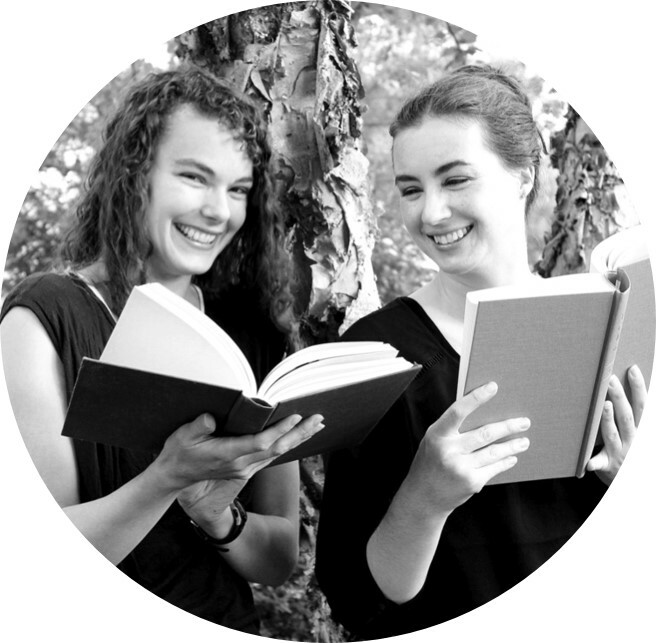 Reading Trouble Makes a Comeback was like hanging out with an old friend. I opened the book and then basically did not stop smiling until I finished it. I am a sucker for smart, snappy dialog, and Ms. Tromly really delivers. Every scene with Zoe and Digby in it is such a treat. I'd read about them doing laundry together. They are that entertaining. But in all seriousness, the plot of this book really moves along and delivers some unforeseen twists and turns. I love Zoe's narration and all the side characters in Zoe and Digby's little gang of misfits. The scenes between Zoe and Sloane were some of my favorite. I also, somewhat unexpectedly, really enjoyed having Cooper around. It's good to have a solid grown-up or two in a book like this. I'm really excited for the sequel. I'm sure I'll be grinning through that one as well. After nearly dying at her father's hands, Mori wants nothing more than for her father to rot in jail, but she knows that her James Moriarty is more than capable of hurting his family even from behind bars. Several of the police officers on the case are friends with Mori's father and would love nothing more than to poke several holes in Mori's story. Protestors are camped out in front of the Moriarty home, and Mori starts receiving threatening letters and weird photographs. No, Mori definitely does not feel safe. There are a few bright spots. Sherlock Holmes continues to be a stolid friend (boyfriend? ), even as Mori debates whether or not she should push him away for his own sake, and Mori's mother's friend, Alice, arrives in town complete with a forged custody file that will allow Mori's brothers to stay in their home. I was not expecting to like this sequel so much. I absolutely flew through this book. I enjoyed the first book in the series, but it was a little dark for me (there was some heavy stuff in the first book), and I remember feeling like I wasn't quite jiving with the writing. I don't know if I was just in the right place this time around or if something changed behind the scenes, but I am now completely sold on this series. One thing I absolutely love about this series is how complicated Mori is. The reader can easily see how Mori could go down path that will lead to the amorality we associate with Sherlock Holmes's nemesis. In fact, Mori clearly identifies and struggles with this aspect of her personality as well. 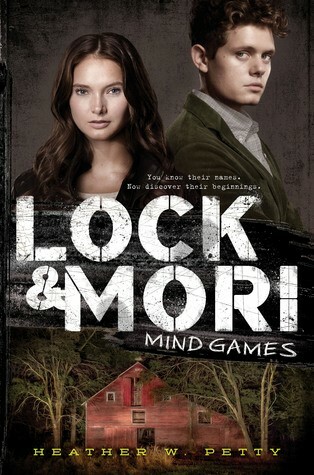 The result is that the relationship between Lock and Mori is so fraught. I just so badly want them to be happy, but I can see the tragedy coming. The twists at the end of this book kind of killed me. I need the next book in the series. Brittany Cavallaro's first novel, A Study in Charlotte, was one of my favorite debuts of the 2016. I just loved everything about that book. I loved the boarding school setting, and the literary writing, and the relationship between Charlotte and Jamie complicated as it is with all their family history. I was eagerly anticipating the sequel. Book two is set during Jamie and Charlotte's Christmas break, and they are back in England spending time with family. Things get icy for the duo when they go to Charlotte's family estate in Sussex. Between weird conversations with Charlotte's parents, Charlotte's mother's poor health, and Charlotte's inaccessibility, Jamie is having a very uncomfortable stay. The only glimmer of light in this weird visit is Charlotte's uncle Leander who is a brilliant detective and Jamie's father's best friend and former roommate. And then Leander goes missing. Charlotte and Jamie jet straightaway to Berlin where Leander was working undercover rooting out a forgery ring. The Moriartys are, of course, the prime suspects. As much as I hate to say it, this book was a bit of a disappointment for me. And that is so painful to say because I was looking forward to it so much! I think the book suffered from the expanded world. Watson and Holmes made so much sense at boarding school, but gallivanting around Europe? It just didn't feel as authentic. Then there is this worrisome ever-increasing darkness in Charlotte (oh, I suppose it was always there but Jamie used to be able to temper it). I'm afraid this series is turning into a tragedy! In that sense, it reminded me a lot of Mind Games, which I just reviewed above and I really like the tragedy in that series, but it's like a knife to the heart in this one. There were some things that I really enjoyed about this book. I really liked the whole art forgery aspects (art historian, here) and settled on thinking of Hans Langenberg as a German Edward Hopper. The grand finale at the art auction was also very entertaining and funny. Also, I loved the chapters that Charlotte narrated so, so much. It was good to have a break from angsty Jamie. (Although, I mostly blame Charlotte's head games for poor Jamie's wallowing.) But be warned, the ending is pretty brutal.